Nearly 40 international experts, policy-makers, researchers and peace activists are at the Magee campus of the University of Ulster this week for the 14th INCORE International Summer School. Delegates come from some 10 countries including Nigeria, Turkey, South Africa, Rwanda, Romania, Japan, Belgium, Spain, Denmark, and the United States. A delegation of twelve students from Utah Valley University in the US will also join the group. The international delegates are joined by local practitioners and scholars for an intense week of reflection on state-of-the art learning and practice in managing, resolving and transforming conflict.Some of these participants are supportedby bursaries from the Community Relations Council. The Summer School led by INCORE staff and other international experts is well established and over the years has built into a network of nearly 600 practitioners worldwide. “INCORE is a global resource for students, academics, and peacebuilders because it integrates all the key components to train effectively peacebuilders, and offers new critical thinking about old and complex problems. We bring students to Northern Ireland because it is the world's premier laboratory for conflict transformation and peacebuilding. No other location holds the concentration of scholars, professional peacebuilders, participants, and victims who are so knowledgeable, articulate, and accessible." As part of the Summer School, INCORE will be hosting the annual Summer School lecture. This year the lecture will be given by Kathryn Stone OBE, Commissioner for Victims and Survivors and will be entitled 'Engaging, Acknowledging and Supporting Victims in Post-conflict Northern Ireland’. Her lecture will provide an outline of the work of the Commission and the Commissioner in engaging, acknowledging and supporting victims and survivors. The lecture is open to the public. Professor Brandon Hamber, INCORE Director added: “This year is a also a seminal year in the life of the city and also Peace and Conflict Studies on the Magee Campus. "It will be a great experience for the Summer School participants to be in the City during its year of culture. This is why we have included a special module focusing on culture and peacebuilding which will focus on experiential learning and use a range of contributors including academics and practitioners from Northern Ireland working on theatre, arts, digital technologies, as well as wider areas such as sport. "Students will of coursebe able to take part in various social and cultural events alongside our programme. 2013 is also the 20thanniversary of INCORE and we have been teaching peace and conflict studies on the campus for over 25 years now. Clearly, there is value in lesson learning across contexts and for over a decade now we have attracted peacebuilding practitioners and graduates to Northern Ireland for the Summer School. "Given the conflicts that rage across across the globe, we need to continue to build a new generation of peacebuilders and reinvigorate peacebuilding work across the world. Along with our MSc. in Applied Peace and Conflict Studies the Summer School we make a contribution to this importanttask." About INCORE:Building on the University of Ulster’s pioneering work in peacebuilding since the 1970s, INCORE(International Conflict Research Institute) was established in 1993 and this is its 20thanniversary. 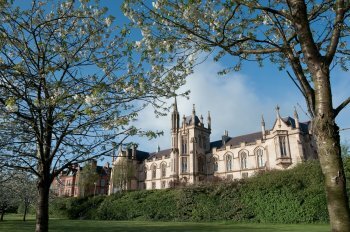 Based at the University’s Magee campus in Derry~Londonderry, it is a centre of excellence, thepremier research institute in conflicttransformation on the island of Ireland, and anassociated site of the United Nations University. TheCommunity Relations Councilsupported the Summer Schoolby providingbursariesfor local participants.The Summer School offers two modules:1.Culture and Peacebuilding,taught by Dr Stephen Ryan and Professor Brandon Hamber (INCORE) In 2013 Londonderry/Derry is going to be the UK City of Culture. It therefore seems appropriate that INCORE will offer a new module on Culture and Peacebuilding as part of its Summer School during this year. Following a general overview of the relationships between culture and peace and an investigation of some key theories in this field, there will be a day each devoted to drama, sport and the moving image and their contribution to peacebuilding. The module will focus on experiential learning and use a range of contributors including academics and practitioners from Northern Ireland, and participants will also have an opportunity to make presentations about their own work or that of their organizations. And 2.Peacemaking and Peacebuilding in Northern Ireland ,taught by Professor Gillian Robinson and Dr. Brendan Lynn (INCORE) This module is aimed specifically at undergraduates or individuals interested in exploring the lessons from Northern Ireland in terms of peacemaking and peacebuilding. Through a series of lectures and workshops with INCORE staff and invited speakers participants will be able to examine some of the key themes and issues for themselves. The subject matter to be covered will include an introduction to conflict transformation and peacebuilding theory; peacemaking and the new political disposition in Northern Ireland; justice, truth and reconciliation; victims, survivors and commemoration; and public opinion and attitudinal change in Northern Ireland.